Pssst! Did you know that football season starts tomorrow? You’re invited to our house! But you can’t bring a friend. We can only fit three adults on our couch and a couple of small kids on the overstuffed chair. Stragglers are welcome to spill out onto the floor, but there’s only a few feet between the couch and the TV so you’ll have lean way back to see the screen, and maybe close your eyes every time there’s a fast-moving montage so you don’t get dizzy and throw up. It’s sort of like sitting in the very front row of a packed movie theater. We’re working on this situation, but in the short term, our strategy is to invite ourselves over to a more suitable game-watching house in exchange for a pot of chili and basket of cornbread. 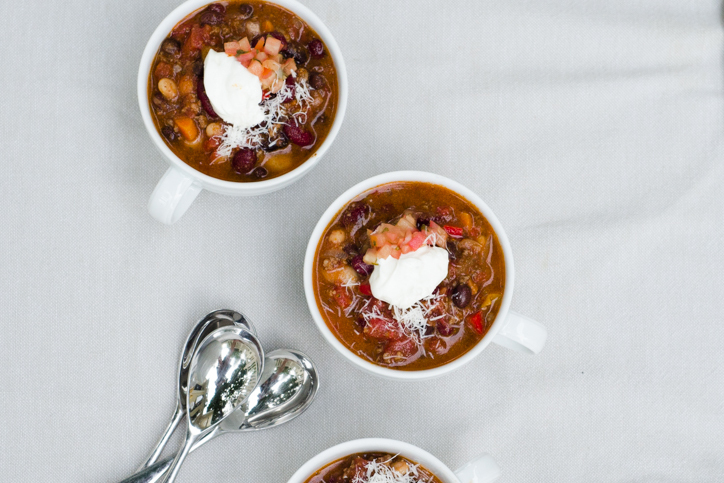 Most people have pretty strong opinions about what belongs in a bowl of chili. Pork? Beef? Beans? Spicy or mild? 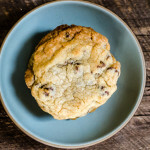 I’ve tried out dozens of recipes over the years, and, though most pass my delicious test, they don’t all pass the crowd test: Will a room of at least a dozen hungry people want to eat it? For this reason, my football chili recipe is easy on the spice, though my usual inclination is to add more heat. It’s flavorful and has great texture, with beef, three different kinds of beans, and a hint of smoke from chiles in adobo sauce. Tiny diced bell peppers and carrots give it a natural sweetness that offset the beefy flavor. Best of all, it tastes even better after sitting awhile, so you can make it hours or even days before the BIG GAME and reheat it at halftime. As a kid in Massachusetts, I thought cornbread came from a little white box with blue lettering. Just add eggs and oil, and voila! A spongy, sweet concoction more like cake than bread. But then I cooked at Magnolia Grill in North Carolina and was schooled in cornbread cookery. 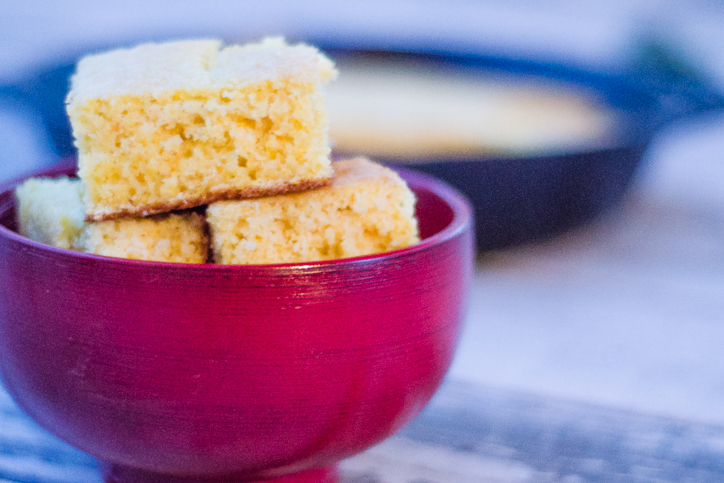 Southerners scoff the stuff we Northerners call cornbread, all smooth and sugary, with a tight crumb and no bite, no burnt corners to crunch through or gritty, coarse cornmeal that crumbles on contact. Northern and Southern-style cornbread couldn’t be more different. 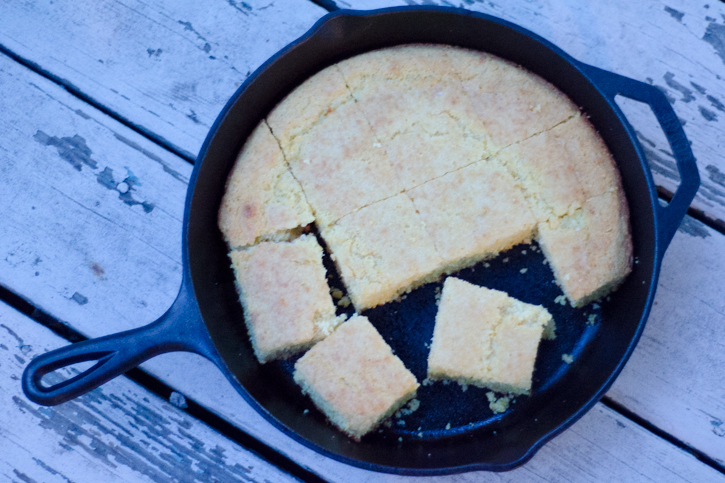 I grew to love Southern cornbread because of its conviction – it’s a salty, coarse bread made entirely from cornmeal, not a yellow sponge cake made of flour and sugar. But, how do you please a crowd of Northerners with Southern cornbread? Luckily, my brother-in-law has solved the problem. 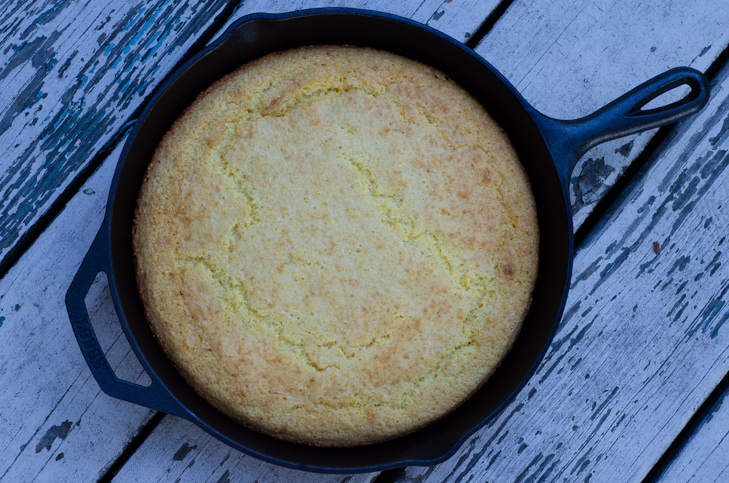 His cornbread is the perfect compromise – half flour, half coarse cornmeal, no sugar and lots of melted butter. It’s gritty but refined, salty, buttery, baked authentically in a pre-heated cast-iron pan, which is always licked clean no matter who’s in the crowd. So…who’s inviting us over? The Game starts at 1. We’ll bring the food! The chili yields about 2 1/2 quarts and the cornbread, 16 squares. This usually serves about 10 (adults and kids), alongside other football snacks. 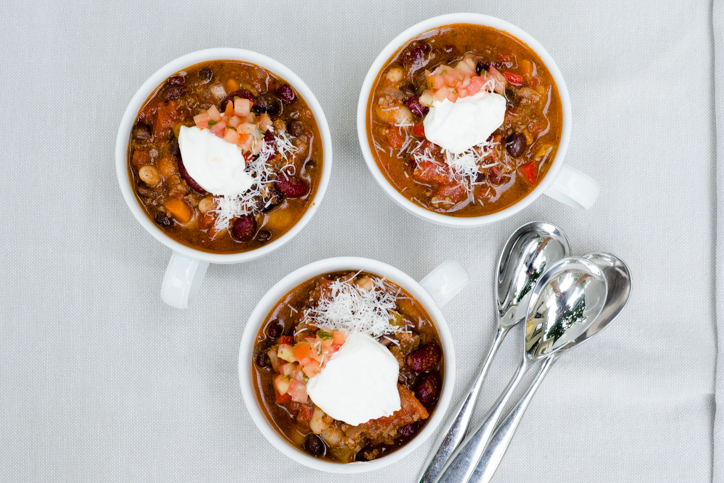 The chili recipe is easily doubled for an even larger crowd and can be made up to three days in advance and reheated before serving. 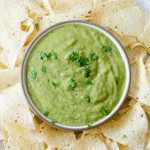 Serve it with grated cheese, sliced avocado, salsa, or sour cream. The leftovers taste great wrapped in a soft shell taco for another night’s meal, or frozen for up to a month. 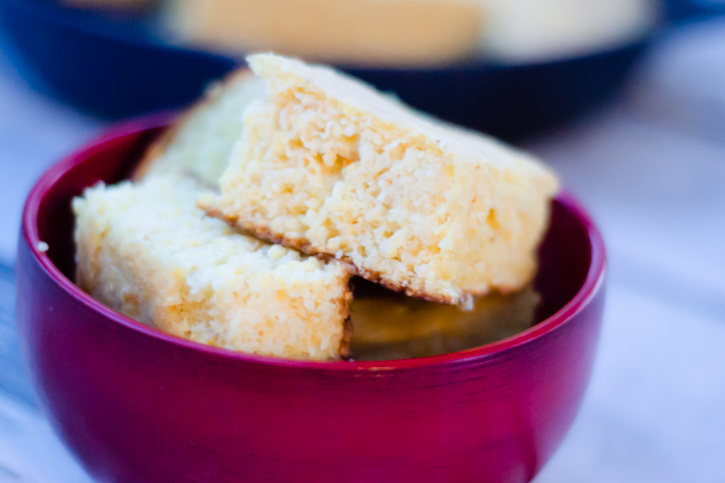 The cornbread comes from my brother-in-law Michael and is the perfect compromise between southern and northern-style cornbread. It is best served immediately after baking. The bread will harden overnight but leftovers (if any) will soften up slightly when reheated. Or, cube leftover cornbread and serve it as part of a sausage, egg and cheddar cheese strata. Most importantly, both the chili and cornbread are crowd-pleasers, sure to secure you a future invitation wherever you happen to bring them. In a 5 to 6-quart wide pot or Dutch oven, heat the oil over medium-low heat. Add the onion, pepper, and carrot and stir cook until the vegetables soften and the onions turn translucent, about 6 minutes. Add the ground beef, salt, and pepper, and increase the heat to medium. Brown the beef, breaking it up with a wooden spoon as you stir. Add the spices, adobo sauce, tomato puree, and water and stir to combine. Reduce the heat to medium-low and simmer, partially covered, stirring occasionally, for about 30 minutes. Rinse and drain the canned beans and add them to the pot, stirring to combine. Simmer, partially covered, for an additional 15 minutes. Serve immediately or cool to room temperature and refrigerate for up to 4 days. The chili can also be frozen for up to a month. As with most soups, the flavors get better with age. This is a great make-ahead meal. Place a 12-inch cast-iron, or other heavy skillet in the oven and preheat to 425 degrees. While the oven heats, combine the dry ingredients in a large bowl. Crack the eggs into a small bowl and beat lightly with a fork. Add the buttermilk and whisk to combine. Make a well in the center of the dry ingredients and add the egg mixture. Stir the wet ingredients into the dry, using a wooden spoon, until just barely combined - there may still be a few clumps of flour and cornmeal. Fold in the melted butter with a few swift strokes and set aside. Carefully, using thick oven mitts, remove the cast iron pan from the oven and swirl 1 tablespoon of butter around the bottom and sides of the pan. 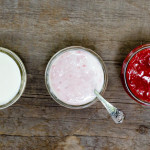 Pour the batter into the pan and bake for 21 to 23 minutes if using a 12-inch cast iron pan, or up to 32 minutes if using a 10-inch, deep skillet or a 9x9 glass or metal pan. When it’s done, the bottom of the cornbread should be dark and crispy, the top beginning to turn golden brown, and a toothpick inserted in the center should come out attached with but a crumb or two. This bread is best served immediately, sliced straight from the pan in steaming squares, accompanied by large pats of butter and/or chili, if you like. Come On down!! 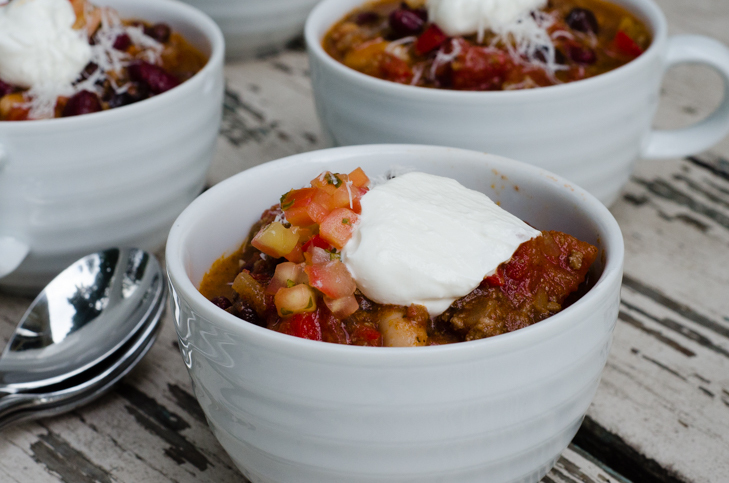 Can’t wait to try this….the chili sounds wonderful and although I’ve lived in the south for over 50 years I was born and raised in the north so this cornbread should satisfy all my tastes! I’m assuming the chili will freeze well also, have you tried that? Love this blog, keep ’em coming!